Explore exciting travel destinations, discover foreign cultures, and enjoy insightful discussions on the latest global business topics. Renowned experts and special guests join us weekly to broaden your international repertoire. Your host, Michael Froehls, is a travel aficionado and former global executive. 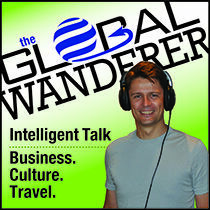 Weekly talk show on Austin's KOOP 91.7 FM (Tue 2-3 pm), also streaming live at www.koop.org The Global Wanderer....where we explore, discover, and enjoy all things international! Interview with renowned Austin-based bass player, composer, teacher, poet, and conductor P. Kellach Waddle. What is the history of the bass? How does Kellach get inspired by foreign music and travel? We listen to 5 of his compositions representing various places around the earth; 2 pieces are world premieres.